SUBHEAD: One of the few decent paying jobs for those without college degrees is threatened. 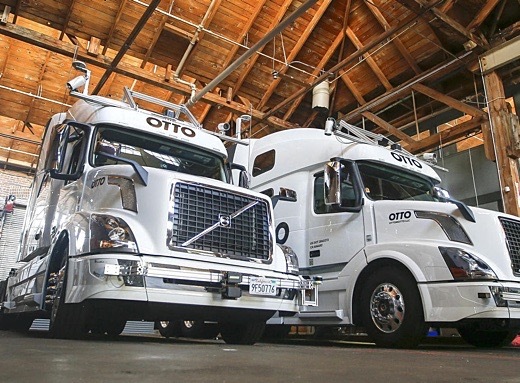 Image above: Two Otto self driving semi-tractors sit in garage. They have been test driving with autonomous technology up and down Interstate 280 and the 101 Freeway. Photo by Tony Avelar. From original article. Trucking paid for Scott Spindola to take a road trip down the coast of Spain, climb halfway up Machu Picchu, and sample a Costa Rican beach for two weeks. The 44-year-old from Covina now makes up to $70,000 per year, with overtime, hauling goods from the port of Long Beach. He has full medical coverage and plans to drive until he retires. But in a decade, his big rig may not have any need for him. Carmaking giants and ride-sharing upstarts racing to put autonomous vehicles on the road are dead set on replacing drivers, and that includes truckers. Trucks without human hands at the wheel could be on American roads within a decade, say analysts and industry executives. At risk is one of the most common jobs in many states, and one of the last remaining careers that offer middle-class pay to those without a college degree. There are 1.7 million truckers in America, and another 1.7 million drivers of taxis, buses and delivery vehicles. That compares with 4.1 million construction workers. While factory jobs have gushed out of the country over the last decade, trucking has grown and pay has risen. Truckers make $42,500 per year on average, putting them firmly in the middle class. On Sept. 20, the Obama administration put its weight behind automated driving, for the first time releasing federal guidelines for the systems. About a dozen states already created laws that allow for the testing of self-driving vehicles. But the federal government, through the National Highway Traffic Safety Administration, will ultimately have to set rules to safely accommodate 80,000-pound autonomous trucks on U.S. highways. In doing so, the feds have placed a bet that driverless cars and trucks will save lives. But autonomous big rigs, taxis and Ubers also promise to lower the cost of travel and transporting goods. It would also be the first time that machines take direct aim at an entire class of blue-collar work in America. Other workers who do things you may think cannot be done by robots — like gardeners, home builders and trash collectors — may be next. “We are going to see a wave and an acceleration in automation, and it will affect job markets,” said Jerry Kaplan, a Stanford lecturer and the author of “Humans Need Not Apply” and “Artificial Intelligence: What Everyone Needs to Know,” two books that chronicle the effect of robotics on labor. The companies pioneering these new technologies have tried to sell cost savings as something that will be good for trucking employers and workers. Otto, a self-driving truck company started by former Google engineers and executives, pitches its system as a source of new income for drivers who will be able to spend more time in vehicles that can drive solo as they rest. Uber bought the San Francisco-based company in August.